Gone are the days of money belts, maps, travel guides, and standing in line. You can use your phone to do most of that. But which apps will get it done? We tried dozens of them, hit the road, and learned from our mistakes. All you have to do is spend ten minutes downloading apps and you will be ready to roll. Travel is spendy. So you get out a laptop and research every hotel, flight, and restaurant before you decide. Oh, stop! Get Dosh. Need a hotel? Fly through a list of deals, right in the app. Tap, buy, and earn reward Dosh you can spend later.Time for lunch? Everyone else throws fiscal caution aside when tummies growl in an unfamiliar town. Not you. You cleverly direct the crowd toward the nearest (good) food where everyone discovers a bargain. Everyone assumes you, as per your usual way, have scoped things out in advance. Truth? By the time you get home, you have accumulated enough Dosh cash from these lunches to pay for that Hula Skirt that seemed must-have after three Mai Tais. I like to hike. Especially when I travel. Exercise and exploration at the same time? What’s not to like? Before Natual Atlas, I spent the first day of every trip asking locals to point me toward the trails. 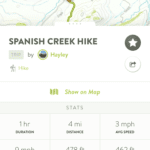 I learned this: Many people have no idea where to hike in their own town. Now I walk out the door, following the Natural Atlas map on my phone to the best trails nearby. I’ve already seen photos, read reviews, am shod and dressed accordingly, and I know how long I’ll be gone. Now, sometimes, locals ask me where to go. How much do you worry about getting to the airport on time? Outsource that. Tripit is an old standard travel app and its basic service is free. 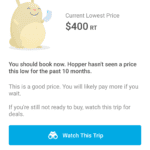 But it’s new feature — Tripit Go — makes the Pro version must-have for anyone who travels often. 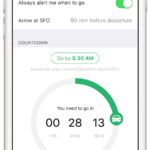 It keeps an eye on your location, flight status, and the traffic and delivers a countdown clock to your phone on when you need to leave for the airport. At the airport, skip the overhead monitors. This app knows the latest gate change. Later – when you arrive at your three-hour layover, starving — use Tripit’s newest feature – Navigator – to pick a restaurant nearby. As ever, the app is awesome at keeping your travel documents, plans, confirmation numbers, and boarding passes right where you can find them – even while taking your shoes off in the security line. Skip the dorky travel belt loaded with cash. Cash lets you swap Benjamins with anyone – using your debit card. 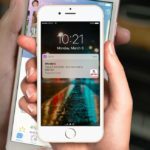 Recipients don’t need to have the app. And you don’t need to manage an in-app balance. It puts the cash people send you right into your bank account. Best part for travel? 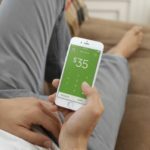 It gives you a virtual Visa number so you can pay with your debit card in that sketchy rug store without giving up your real digits to potential fraudsters. Instead of constantly updating everyone at your destination as to your new arrival time, send them a Glympse. It will let them watch you travel in real time. 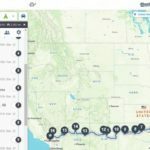 Everyone will have a blast watching your route on a map. The detail is amazing and it is up-to-the-second. But you tell it how long people can see where you are so you aren’t giving up your privacy forever. Will you get a better price on airline tickets if you wait a week? A month? There is a pattern to this. But who knows what it is? Hopper knows. Input your plans and go back to what you were doing. It will keep an eye on things and tell you exactly when you should buy to get the best price. It bases its decisions on more data than you can compute. Don’t spend days asking friends and Googling before you hit the road. Get Roadtrippers. Tell it where you are going and when, give it a minute, and it will show you everything stoppable along your route: hotels, attractions, museums, zoos, camping, you name it. Tell it to leave out what doesn’t interest you. Do it on a big screen and send the plan – once you get it right – to your phone. Done. On the road, it tracks where you are and what’s near. No more books, maps, or notes. If your destination is urban, skip the rental car, because you’ll end up taking public transportation and cabs. But sign up for Zipcar (starts at $7 a month) and download the app. 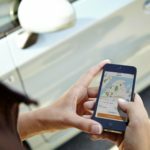 If you need a car, the app will locate one nearby. Tap the app to rent that car and unlock it with your phone. Drive it to your destination and park in the Zipcar-only spots. Sweet. Ever walked a mile to hail a cab? Ohferchrissakes! Get Lyft. Open the app, call for a ride, and your car will come to you. 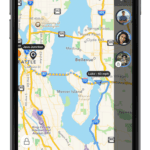 You can see where your driver is on a map on your phone, see where you are as you ride, and leave a review if it all goes well. 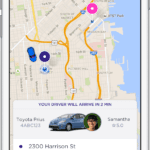 Prices are set by Lyft. And you don’t need cash. Just pay with the app. You wander the shops, jet lagged but game, and discover what appear to be the shoes you have been waiting for your entire life. And they are bargain priced. Or maybe lack of sleep and the wine on your flight conspired to make you price stupid? 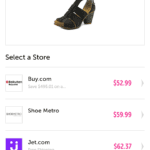 Scan the bar code with Yroo and it will tell you what those shoes go for elsewhere and the price history. Still a good deal? Buy! You can do this for everything from cookies to computers, instantly price comparing online and offline stores. Christina Tynan-Wood is a freelance writer living in Portland. She has covered technology since before Bill met Melinda (Gates) and before anyone met Google.